The equity markets have had all the glory over the past four months. Those looking elsewhere may be asking what about bonds? Like the movie "What About Bob?" the bond market is suffering from multiple anxieties, including global debt crisis, inflationary fears, too much liquidity, stronger economic growth and Fed policy. Through much of last year, bond yields continued their multi-year decline, ultimately bottoming out just before Christmas with 30-year Treasuries yielding a paltry 2.85% and a mere basis point (0.01%) on anything held for 3 months. Today the 30-year has increased to 3.33% and 3-month bills have vaulted to 0.10%. While higher rates will ultimately be a good thing for income investors, the path to higher rates will leave bond investors with principal losses as rates rise. The bond market is somewhat on the other side of the virtuous circle. Today, we may be embarking upon the vicious circle where losses on principal are greater than income generated, leaving fixed income investors poorer at the end of the year. So what about bonds? What are some fixed income alternatives that don’t involve investing in stocks? There have been plenty of recent articles outlining the case for higher interest rates and the doom of the fixed income investor. The “bond bubble” that is sure to wipe out investors may be a bit overstated. For example, a 10 year bond at 2.2% today selling at par ($1000) would be worth $940 in a year (income included) if the 10-year were to rise to 3%, and $862 if yields approached 4%. While a loss of 6% and 14% are nasty in any one year, holding the bond to maturity will at least assure you of the return of principal (your $1000) and an income stream of a whopping $22/year. The assumption made in many of the articles is an investor buys bond mutual funds rather than the individual bond. The bond fund, of course, has no maturity, no certainty of cash flow as the portfolio constantly changes as the manager repositions the portfolio. So while the individual bond holder is made whole at the maturity of the bond, the same may not be said for the bond fund investor. Even if rates were to rise to 3% and decline back to present levels, the bond fund is not likely to be worth the same as today as the portfolio will be very different due to investment changes within the portfolio. Whereas a rising tide tends to lift all boats in the stock market, a rising interest rate environment doesn’t necessarily affect all bonds the same way. Let’s take a look at some alternatives to treasury bonds that have moved very differently from treasury bonds over the past few years. The Treasury has the power of the printing press. No matter what happens, investors are sure to get their money back, albeit with less purchasing power. What about corporations? They are flush with cash right now and are not pressed to issue additional debt. Using mutual funds available through Charles Schwab, I did a search of intermediate term bond funds with at least a three year track record. The search resulted in just over 550 funds. The average return for the group is just over 2% for the first 2 ½ months of the year, while a similar search of intermediate government bonds (200 funds with a 3 year record) had an average return of merely 0.30%. Corporate bonds have provided a better return than government bonds so far this year. Looking at the past three years, corporate bond returns have been intertwined with the equity market, as they provided better relative returns in the first half of 2011 while stocks were rallying and had relatively poor returns during the last half of 2011 when stocks struggled to find their footing. So if you believe that the stock market can continue to trudge higher over the coming months, a fixed income investor might be able to piggy back the equity market by investing in corporate bonds. A bit further up the risk scale, but in keeping with the equity market theme are emerging markets. Emerging stock markets in general have performed better than US markets since the recent market bottom in late December. Similar to corporate balance sheets, emerging market economies are in much better shape than many of the “mature” economies. If there is a global slowdown, many of the emerging markets will be impacted and could jeopardize the returns of their bonds as investors shift toward the safety of US treasuries. However, IF the assumption is that Treasury bonds continue to decline for the reasons outlined above, then emerging markets may be a better way to play fixed income investments. The key will be the dollar, as many of the bond funds do not hedge their currency risks. This means a stronger dollar will provide a headwind to returns from emerging market bonds. Again, for comparison, looking at a Schwab universe of emerging market bonds that have been in existence for at least three years their average performance year to date is a near equity like return of just over 6.50%. Finally, concern has been growing that the Fed has lost control of monetary policy, as their response to any economic weakness is to inject additional funds into the economy. The argument is that inflation is just around the corner. In response to rising inflation, the Fed will have to increase interest rates, thereby hurting the bond investor. One creation to thwart this risk is Treasury Inflation Protected Securities (TIPS). These bonds are designed to increase the maturity value in line with the rise in inflation, while the interest payment remains fixed. There are now plenty of bond mutual funds that invest exclusively in these types of bonds. Using the same search criterion as before; there are nearly 100 of these funds that have been around for 3 or more years. So far this year, these funds have averaged a nearly 2% return, similar to those achieved by corporate bonds. The chart shows the closing price of the fund in the top panel and the relationship between the price of the fund and the broad bond market in the lower panel (relative strength). The relative strength of the fund to the bond market shows the change in relationship between “risk on” and “risk off”. 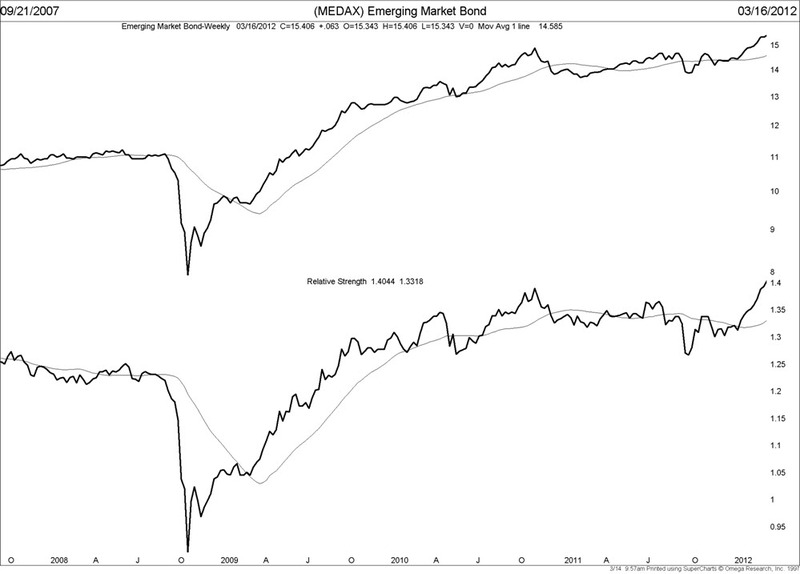 As the equity market collapsed in 2008, so too did emerging market bonds, and recovering well ahead of the ultimate stock market bottom in 2009. The worst performing equity asset class last year, emerging market bonds also performed poorly as compared to other bonds, however beginning this year, the emerging market bonds have soared. While the death of the 30 year bull market in treasury bonds may indeed finally be at hand, there remain opportunities in other markets outside of treasuries. Investors will need to look at a combination of corporate bonds, inflation protected notes and emerging market debt funds to achieve decent fixed income rates of returns in what is likely to be a rough environment for fixed income investors.